May 27th 2009 marks the start of Slow Food Chicago Tomato Fest 2009. The tomato festival is a project of Slow Food Chicago, Candid Wines and the Chicago Honey Coop. Gardeners and urban farmers, in and around Chicago, will have the opportunity to buy heirloom tomato plants for $3:00 a plant. The first heirloom tomato plant sale will take place on May 27th, 2009 at the Garfield Park Conservatory from 4:00pm-7:00pm. The second heirloom tomato plant sale will take place on June 5th, 2009 at the restaurant Uncommon Ground on Devon from 4:00pm-8:00pm. Everyone who buys a heirloom tomato plant will be invited to the Second Annual Tomato Festival in September at the urban bee farm operated by the Chicago Honey Coop. Heirloom tomato growers will get a chance to share some of their crop with their fellow heirloom tomato grower. If you're in Chicago, and haven't already done so, request your free bean seeds for One Seed Chicago. If you you're looking for gardening information try my Google Custom Search Engine--Google for Gardeners. Use it to find information on plants, and gardening tips and tricks. I had no idea there were so many heirloom varieties, MBT. Thanks for the list. I'm glad someone cares about saving seeds and preserving those unique plants. Next year, I'm determined to try some heirloom plants in my garden if I can find a good source for the seeds. MBT, yay how exciting! We have something similar and an heirloom tomato tasting later in the season. If there's any way I could get some seeds of the true black Brandywine, I'd be so happy! Walk2Write, that's just a tiny portion of heirlooms. I'm growing 12 myself and none of those is listed... 100s and 100s! This year, I bought my heirloom seeds from the Seed Savers Exchange (www.seedsavers.org). For about $1, I've started over a dozen healthy young plants already. I've given half of them away! The Seed Savers have many, many heirloom varieties of tomatoes and other veggies. Edible Gardening in 2009About Botanical Interests & Renee's Garden. Two seed companies that are very nice people AND carry a good variety of heirloom seeds. @Monica, I'll see if they have any of the Brandywine if I go to the sale on the 27th. @Recessionista, Good tip about the Seed Savers exchange. Wish I could be there - I could add some swedish heirloom tomatoes to the batch (if that's allowed, seeds from the US are allowed into Swedenm I know that much). I should not have clicked! The absolute last thing I need is another heirlom tomato plant, the the draw of Japanese Triefle is very strong. I could find see for that anywhere this winter! Do you get a choice of plant or is it luck of the draw? We should have Brandywine and Japanese Black Trifele at both sales. If you would like me to be sure that we bring them, please let me know what you are looking for. Thanks for all of your interest, and please help spread the word. We have roughly 800 plants! You are so very lucky you mid-west tomato lovers. In Southern California we have crappy tomatoes; so very bad. 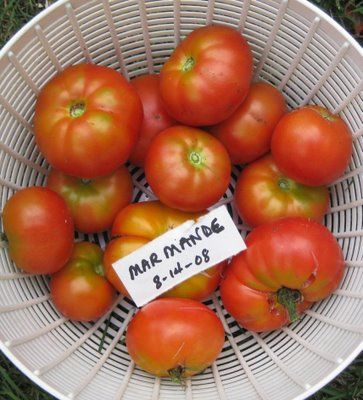 My Indiana uncle would grow the most wonderful tomatoes and ship me a few each year. Cost a fortune but oh so worth it. Even the heirlooms in the farmer's markets aren't as good as yours. You lucky devils. Yay Black Cherry! I've been looking all over for them. Thanks for reminding us about this. Rosengeranium, Now you have me curious what kind of tomatoes you all have over there that we don't have here. Stacy, I contacted Damien and he kindly replied to you above. Damien, Thanks for taking the time to come here and give Stacy a reply. Moon, That's interesting. I would have thought that will your weather you'd have better tomatoes. I'll eat a couple on your behalf this year. Xan, Thanks for stopping by and I hope you can get out to buy some.